» Company Electric Fuel Corp.
» Size: 2.5" x 2" x 0.5"
Are you tired of dealing with batteries and A/C adapters when you want to recharge your Visor Prism or VisorPhone? Do you want to use an environmentally friendly power source? Then check out the Instant Power Charger (IPC) by Electric Fuel Corporation. The Instant Power Charger is not your typical battery charger. Electric Fuel designed the IPC initially for quickly recharging cell phones, but now you can recharge the Prism with it as well. The IPC has two parts: a cable adapter connects from the Visor Prism to a special PowerCartridge that recharges the Visor. The cable has a green LED that indicates that power is being provided to the Visor and goes off when the PowerCartridge is empty. 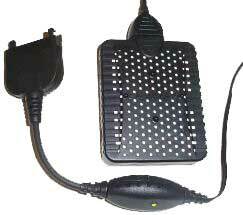 It plugs easily into the Visor and the PowerCartridge. The connector to the Visor has two buttons that you press in when disconnecting. A foil package is included for storing the PowerCartridge when it is not in use. The PowerCartridge uses zinc-air cell that allegedly provides six to eight hours of recharging time for the Prism according to lab tests. I wanted to do a real-world usage test of the IPC, so I drained a Visor Prism by running a muted (for my sanity) Teal Movie at full brightness continuously until the battery meter indicated that the Prism was at 15% with a load of 1549 milli-watts. I then connected the IPC to the Prism and timed how long it took for the Prism's LED recharge light to go solid. At one point, I had to unplug the IPC and plug it back in because the cable showed a red light. At this point the Prism was at 89% and a voltage of 4086 milli-watts. In my testing, it took almost two and a half hours to fully recharge a Visor Prism that was turned off. This takes longer if you use the Visor while recharging. While recharging, the PowerCartridge will get quite warm -- not so warm that it's uncomfortable to hold but still warm enough to come in handy on a cold winter's day. I repeated this test until the light on the IPC cable went out. On subsequent charges, I began with the first battery warning at 30%. I was able to get a total of 3.5 charges out of a single PowerCartridge. During the fourth charge, the Prism's recharge light went solid even though it was only about 60% full. It also wouldn't charge in the Prism's cradle. I had to do a soft reset to get it working again. Repeated attempts to charge with the IPC produced the same result.